Today, buying a business email list. that delivers the right information at the right time is indeed a challenging task. In the recent times, the number of email list providers has increased enormously, making it difficult for businesses to decide whom they should choose. But among these vendors, finding the one who has relevant and updated database is what matters. Everyone provider claims to provide quality email addresses, but most of them prove to be vague, offering you outdated and incomplete data that makes your business vulnerable to failures and causes unnecessary wastage of your money. While choosing the source of an email list, you have to be very careful and alert so that anyone doesn’t fool you. In the market, some companies who will offer you 100 percent accurate data, making big promises. Let us tell you, beware of such fake people. No one in the industry can guarantee you to deliver an entire bunch of factual data. 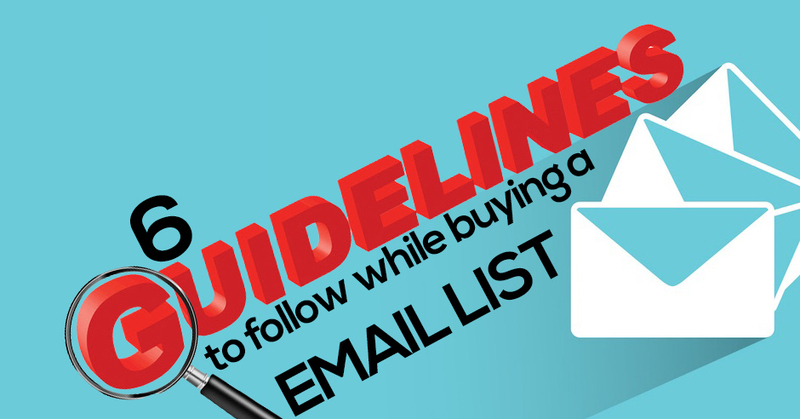 So, before purchasing an email list, keep in mind the following six rules that will prevent you from being fooled. Before buying the list from a provider, try to speak to them directly. If you are not able to come in contact with them, then remember there is something fishy about it. The company should be transparent to you and should be available to answer your queries anytime. When you send an email, you target a particular person, not the company in general because by doing so your message gets unnoticed. If the provider you have hired for the list gives you a database containing generic email addresses like [email protected], then it’s indicative of the fact that they don’t have a researched database, and you should avoid them. They have just compiled the list by surfing the internet with no extra effort put into it. A genuine provider will provide you a business email list that will have contact details of individuals such as C-level executives and other decision makers. Make sure that the source of email addresses you are opting for ensures high delivery rate. The list you buy may contain bad or wrong email addresses then ISPs will block even the other good-deliverable email addresses or divert them to SPAM box, making your campaign useless. You need to demand a 90 plus delivery rate from the provider to ensure that your emails are not blocked in the long run. Some sellers promise to send you free email addresses to compensate for your those emails that got blocked or diverted to the spam box. But such offers will not meet your purpose. If once they can provide incorrect email address there are high chances that the free data they provide you can also be of poor quality again. So, it’s better not to take chances. Select a seller who gives money refund guarantee. Having the full name and the direct emails address of the email recipient is crucial for your business. Without accurate information, you cannot shoot in the dark which means you cannot target the right customer you want to reach. So, request the email list provider to give you complete details. Once you get a sample file of email addresses from the seller, make a random selection of any contact number and give them a call to check the validity of the data presented to you. And to do so, you need to have phone numbers for every record on the list. If the seller doesn’t give these details, then don’t buy from them. There are many to impress you with exclusive promises but when you are purchasing an business email list. look for quality and authenticity. Don’t fall prey to frauds who will take away your money and leave you with a list of no use. Keep your analytical eyes open and then decide whom you can trust.